Arnold Reed Bickett was born August 21, 1876, in the City of Xenia, Xenia Twp., Greene Co., OH, and died March 17, 1930, in Yellow Springs, Miami Twp., Greene Co., OH, at age 53. Buried in Glen Forest Cemetery, Yellow Springs, Greene Co., OH. He is the son of George McVey Bickett of Xenia Twp., Greene Co., OH, and Ruth Elizabeth Simons of Clark Co., OH. Never married. Arnold Reed Bickett was born August 21, 1876, in the City of Xenia, Xenia Twp., Greene Co., OH. The 1880 U. S. Census taken on June 9, 1880, shows George Bickett (age 28) born in Ohio to Ohio-born parents is a plumber living on Hinling Street, 3rd Ward, Xenia, Xenia Twp., Greene Co., OH. Living with him is his wife Elizabeth Bickett (age 27) born in Ohio to Ohio-born parents. Also living at home are their children born in Ohio: Arnold Bickett (age 4); and Maud Bickett (age 2). Also living there was a boarder, William Simons (age 25) who was a coal merchant. William Simons is the brother of Ruth Elizabeth (Simons) Bickett. 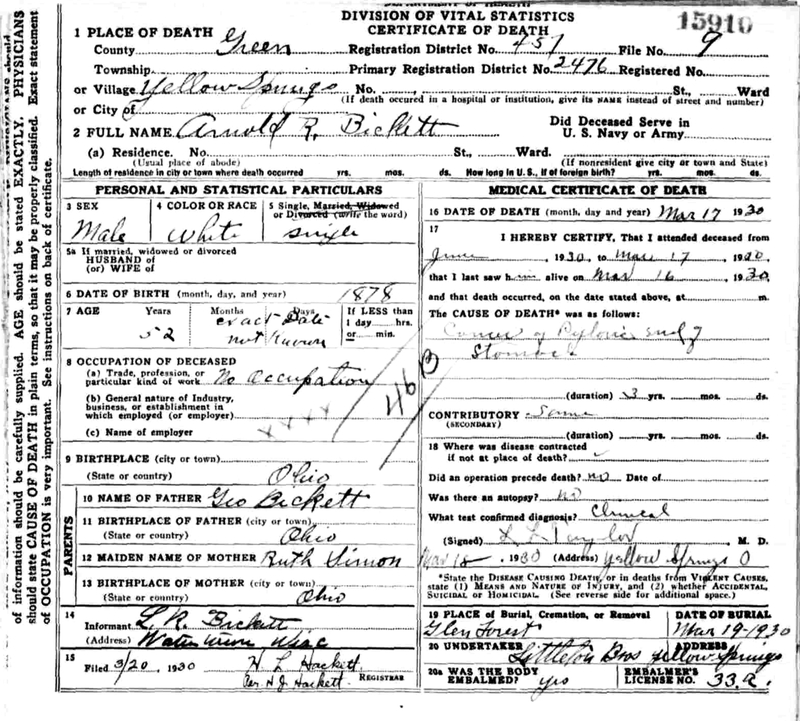 The 1900 U. S. Census taken on June 14, 1900, shows George M. Bickett (age 48) born September 1851 in Ohio to Ohio-born parents is a plumber married for 24 years living in his own home in Xenia, Xenia Twp., Greene Co., OH. Living with him is his wife Ruth E. Bickett (age 47) born in Ohio to New York-born parents, with 5 of her 6 children still alive. 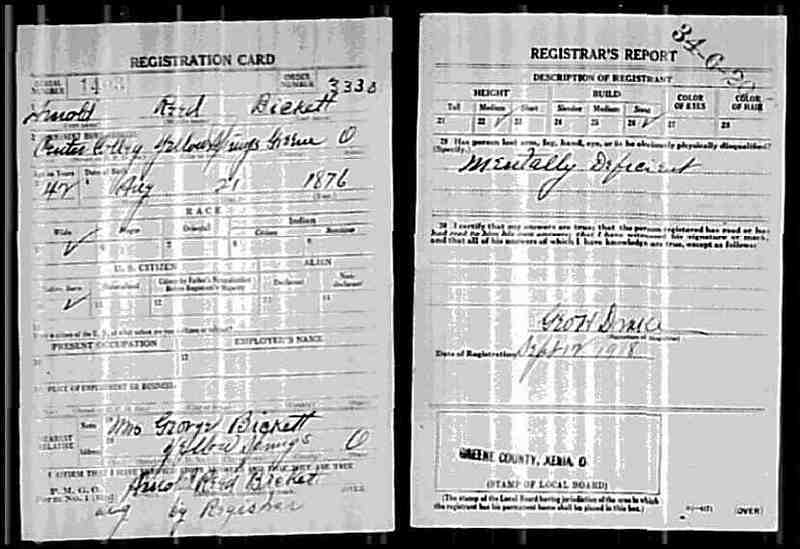 Also living at home are all five of the living children, all unmarried and born in Ohio: Arnold R. Bickett (age 23) born August 1876, not employed and can not read or write; Maud F. Bickett (age 22) born February 1878 and not employed; Leroy Mc Bickett (age 18) born May 1882 and is a blacksmith; Manley E. Bickett (age 14) born September 1885; and Dora A. Bickett (age 11) born August 1888. 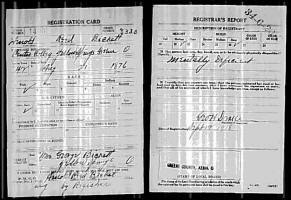 The WWI Draft Registration Card and Registrar's Report dated September 12, 1918, shows Arnold Reed Bickett was judged Mentally Deficient. The Registrar signed Arnold's name on the form. Medium Height and Stout Build. Mrs. George Bickett of Yellow Springs is his nearest relative. His employer is Center College, Yellow Springs, Greene Co., OH. Arnold Reed Bickett died March 17, 1930, in the Village of Yellow Springs, Miami Twp., Greene Co., OH, at age 53. Buried in Glen Forest Cemetery, Yellow Springs, Greene Co., OH. 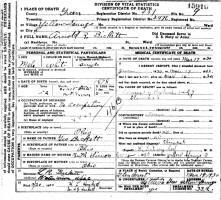 Arnold Reed Bickett Death Record. Primary Cause of Death: Cancer of Pyloric end of stomach of 3 years; Secondary Cause of Death: Same. Never married. Mr. and Mrs. Roy Bickett, Watertown, Wis., have arrived in Yellow Springs to attend funeral services for Mr. Bickett's brother, Mr. Ernest Bickett, who died at his home in Yellow Springs, Monday.